A delightful island off the Atlantic coast of France with fine sand beaches, good surfing, and 110 km (68 miles) of bicycle paths and many other leisure activities to enjoy. The Île d'Oléron off France's Atlantic coast west of Rochefort and south of Île-de-Ré (map) was once a valuable military asset, but today is put to better use as a vacation destination, mostly by French holiday-makers during July and August. The island, 30 km (19 miles) long and 8 km (5 miles) wide, is connected to the mainland by a road bridge (free). Besides its historic main town of Saint-Pierre d'Oléron and the military citadel village of Château d'Oléron, Île d'Oléron has sandy beaches good for swimming and surfing, stables for horse-riding, campsites, and a 110-km (68-mile) network of bicycle paths. The island village of La Cotinière is the most important fishing-boat harbor in the département of Charente-Maritime, so there's plenty of fresh seafood to enjoy, including the island's own renowned oysters. 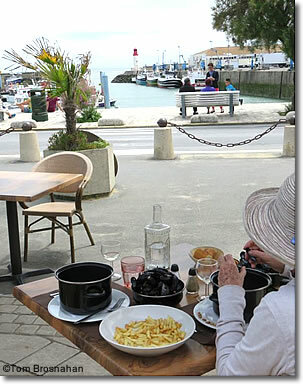 Lunch of Moules-Frites with a lighthouse view at La Cotinière on the south shore of Île d'Oléron.